Your marriage is more than a sacred covenant with another person. It is a spiritual discipline designed to help you know God better, trust him more fully, and love him more deeply. What if God’s primary intent for your marriage isn’t to make you happy…but holy? 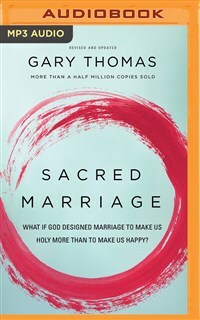 This revised edition of Sacred Marriage takes into account the ways men's and women's roles have expanded since the book was first written. It has been streamlined to be a faster listen without losing the depth that so many listeners have valued. Gary’s books have been translated into more than a dozen languages and won numerous awards. His writings have established him as a thought-leader in the areas of marriage, parenting, and spiritual formation.